10 platinum coated DE safety razor blades. 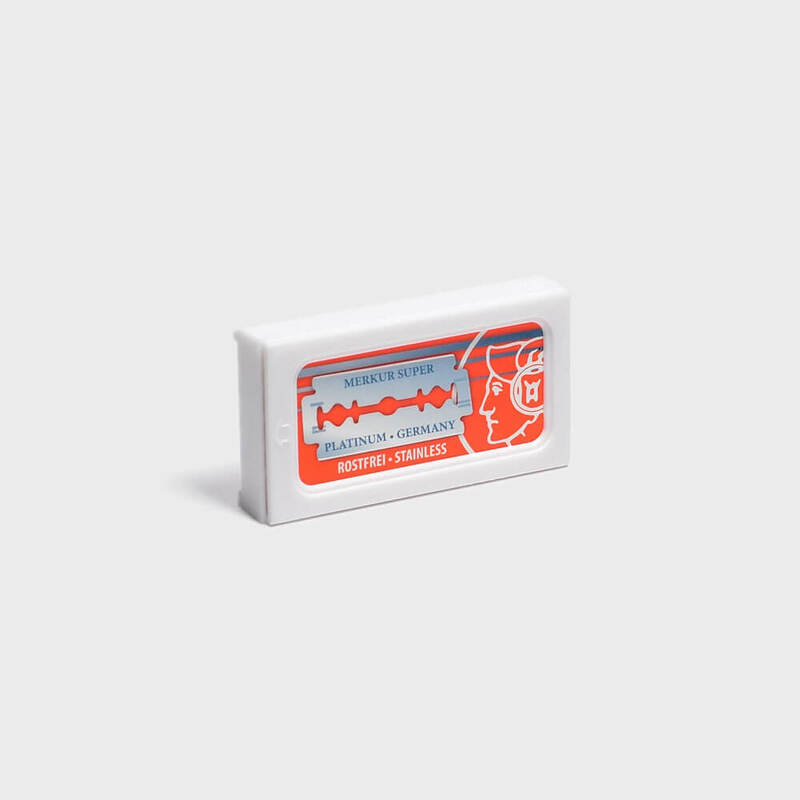 Merkur’s platinum coated DE safety razor blades are supplied in a pack of 10 and are suitable for use with all DE safety razors. The blades are housed in a plastic dispenser with a slot (at the rear) for disposing of used blades. The blades are made in Germany by Merkur. Good blades. Ideal for a beginner. Compared to likes of Gesther though they seem comparatively a bit dull. Great blades. Sharp enough to give a close shave but not so sharp that you end up with nicks. These blades are well worth their cost. Try them ! I’m sure you will agree. Unlike my previous razor, this one tends to cut and Nick my face. Have gone back to using my previous razor. Very happy with my purchase. Blades perform very well. Quick and efficient. Happy to use this seller again. I always buy these blades. They are not the cheapest but they are the best I’ve found and last a decent length of time. Thought the blades were the art of German engineering but found them to be far inferior to the feather blades they seemed to drag I thought it was a rouge blade but have used 3 now there all the same was very disappointed, there probably ok for a teenager’s face. I would like to thank you Shave Lounge team for their excellent customer service I have received after my order went missing in delivery….my order was not only resent immediately but I was timely informed about its status…thank you so much…very reliable site…and quality products….very good blades. I started using de razors and blades after wanting to break free from the monopoly of the so called market leaders and their high prices, is it no wonder that razor blades along with wines and spirits are security tagged at the supermarket. After trying several different makes of blades I’m happy to stay with merkur, although I’m no expert I find the razors stay sharp giving very little irritation even though I have sensitive skin, I also find it reassuring that I use merkur blades in my merkur razor, a perfect combination. The service from Shave Lounge has been excellent with great communication and super quick free posting. A job well done. I started using a double edge razor again about 6 years ago and bought these blades then. I have tried others but these are the best. Good quality blades that last a long time. Excellent service. Very promptly delivered exactly what I ordered. Only just started using Merkur but so far I’m very pleased with them. These blades are value for money, and I got a great service from Shave Lounge. These blades are excellent and represent great value for money.